Teatru Astra is proud to announce another breakthrough within the ambit of its opera productions; a new ambitious endeavour in an international collaboration - arguably the first of its kind for the Maltese islands. 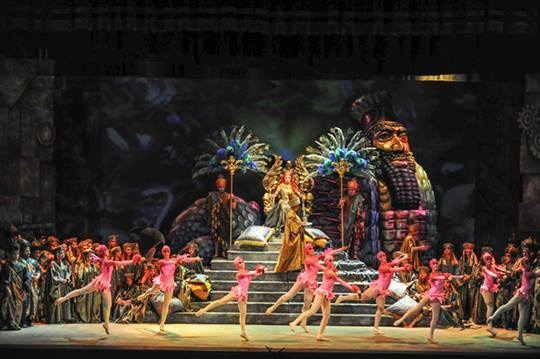 Following the successful staging of Nabucco on the 23 and 25 October, both dates being booked out in advance, the scenery and props that were constructed by the backstage team at the Astra have been chosen for a similar production which will be staged in Rimini this coming week, precisely on the 1st and 3rd January 2015. The production will take place at the Stadio 105 Rimini which has a seating capacity of around 4,000. The scenery was devised, built and put together by a team of volunteers led by Teatru Astra’s own scenic artist Joseph Cauchi and operations manager Andrew Portelli, on designs prepared by Italian regista, Enrico Stinchelli. The sophisticated and attractive set and the mise-en-scène have been widely acclaimed by thousands of opera patrons and have received glowing reviews penned by local and foreign critics. Two containers loaded with the scenery were prepared earlier this month and shipped to Italy. A group of six technicians from Teatru Astra are currently working on the installation of the scenery at the Stadio 105 and will be operating the stage for both productions. The Ministry for Gozo is supporting this venture. On a national level, Teatru Astra considers this as a golden opportunity to market our islands, especially its attractions in the cultural sphere. On a personal note, this project is another feather in Astra’s cap, further consolidation of its excellent opera productions which, over the past decades, have been fast gaining an impressive recognition beyond our shores. In the coming weeks Teatru Astra will be gearing up for the 2015 opera, namely, Giacomo Puccini’s La Bohème, scheduled for 29th and 31st October 2015. It will be the highlight of its fourteenth edition of Festival Mediterranea.